Type your TNT tracking number below, get live delivery information with our express tracking system. TNT Express is an international courier delivery services company, now a subsidiary of FedEx but originally with headquarters in Hoofddorp, Netherlands. The firm has fully owned operations in 61 countries and delivers documents, parcels and pieces of freight to over 200 countries. The company recorded sales of €6.91 billion in 2015. Its major competitors include United Parcel Service (UPS) and DHL. TNT's competitor FedEx reached an agreement to buy the company in April 2015, which was completed on 25 May 2016. If you have problem with our express tracking system, please track your package directly on the TNT website. If you get no tracking information from TNT official website, you’d better contact them. Check digit shows whether TNT tracking number contains a mistype. 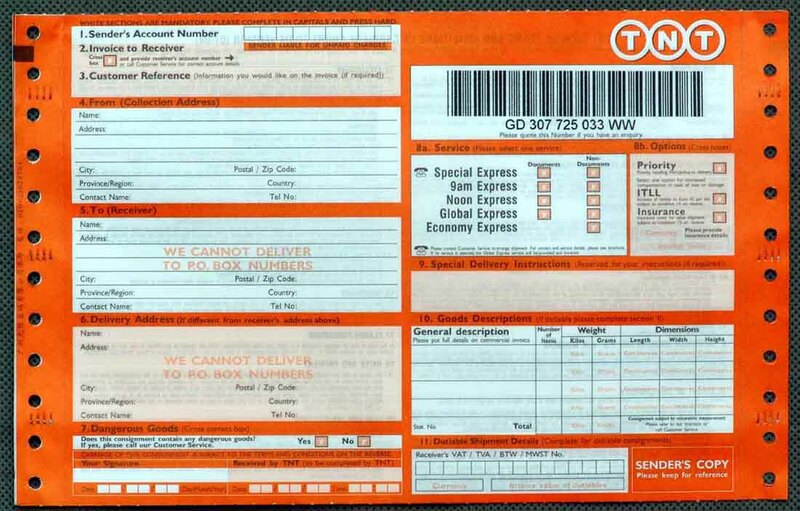 Here is a waybill sample which shows the TNT tracking number is GD307725033WW. How Many Ways to Track TNT? Where is the TNT locations near me? We have collect TNT locations in some countries, including address, telephone number, hours of operation, pickup times, etc,. Just choose your cities and find TNT locations near you.